Thank you for your interest in Stark Industrial! Please complete the form below and we’ll respond promptly. Fixed Limit (Attribute) gaging sorts parts as either "good" or "bad" in terms of an essential quality or characteristic. Variations in size are not quantified. Inspection by attributes implies the use of Go/NoGo gages, which represent the Minimum and Maximum Limit of the product part characteristic to ensure proper assembly and fit. The characteristic is inspected in terms of its FUNCTIONAL SIZE. Fixed Limit gages are easy to use, and Go gages which are properly made and in tolerance guarantee interchangeable assembly. The Go gage should accept the product thread for the full length of thread. 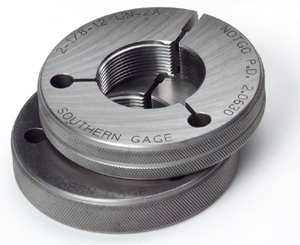 The NoGo gage should not accept the product thread, however, a limited entrance is allowed (three turns-inch or two turns-metric) providing for wear on the gage. Go gages which are properly made and in tolerance provide assurance that mating parts will assemble. The Go thread ring checks the maximum functional size of the external (screw) thread and the Go thread work plug checks the minimum functional size of the internal thread, establishing that the maximum material condition of the product has not been exceeded. Initial costs of fixed limit gaging are less than variable thread gaging systems. © Copyright 2019 Stark Industrial, LLC.